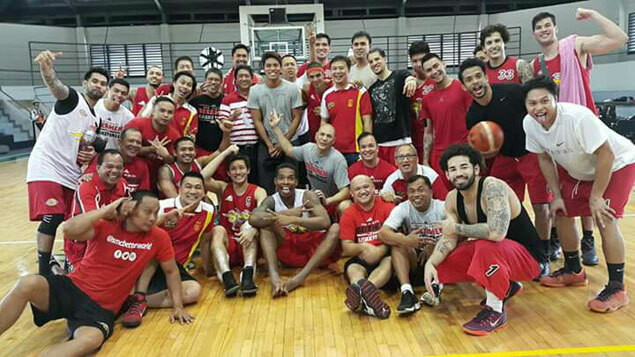 Bitoy Omolon, 36, dropped by San Miguel's practice for the last time Friday to say his goodbye to the team. Photo from Bitoy Omolon's Facebook account. A back-up forward in San Miguel’s last three PBA championships including the historic ‘Beer-acle,’ has decided to officially hang up his jersey. Veteran big man Nelbert ‘Bitoy’ Omolon retired from pro basketball on Friday, ending a 12-year roller-coaster career that saw him win championships with the Sta. Lucia Realtors and the Beermen. The 36-year-old forward, a first round pick of the Realtors (No. 8 overall) during the 2004 Rookie Draft, dropped by San Miguel’s practice for one last time at the Acropolis gym in Libis to say goodbye to the team that has been home for the past two seasons. San Miguel team manager Gee Abanilla confirmed to SPIN.ph Omolon’s decision to retire. “He passed by yesterday (Friday) in practice to say his goodbyes and gratitude to the team,” said Abanilla. Omolon had an expired contract with the Beermen and opted not to fight for a spot in the team’s 15-man roster for the coming PBA 42nd season, which kicks off Sunday. According to Abanilla, the 6-foot-4 native of Talagak, Bukidnon has a ready fallback now that his pro career is over. “He will be embarking on a new chapter in his life, most probably in rubber farming and agribusiness,” shared the San Miguel executive. Omolon came over to San Miguel as a free agent in 2014 when Leo Austria took over the coaching chores of the franchise. He was a reliable bench player who became part of the Beermen’s three title-winning teams – the last of which came in the 2016 Philippine Cup when they beat the Alaska Aces by becoming the first team in league history to overcome a huge 0-3 hole in the finals. The product of Philippine Christian University won his first league title with the Realtors during the 2007-08 Philippine Cup under coach Boyet Fernandez. He was acquired by Meralco when the Bolts bought the Sta. Lucia franchise in 2010. After two years, he was traded for the first time in his career to Air21, where he played for a season before finding himself going back to Meralco a year after. Following his second stint with Meralco, Omolon was finally signed by the Beermen. In his Facebook account, Omolon posted photos of his last visit to the team practice. He later wrote, ‘It’s very hard to say goodbye to my brothers,’ and used the hashtags #Retirementspeech #SMB #2 yrs #3Rings #History. “I don’t need a crowd, I just need a family,” he added.